If you are shopping for a new or pre-owned Toyota near the Petoskey, MI area, then Fernelius Toyota invites you to discover our extensive selection of quality vehicles at driver-friendly prices. Our Toyota dealership in Cheboygan, MI has been serving nearby drivers from throughout Northern Michigan, Northeast Michigan and even the Upper Peninsula since 2004 with family pricing and family care! Whether you are from Gaylord or Sault Sainte Marie, we welcome you to become a member of our family today! Our friendly, caring and trustworthy staff is here to make your visit a pleasant experience, so shop for a new Toyota or stop by our service center with your Toyota for maintenance. Turn to the Fernelius Toyota service center and parts department for all of your auto maintenance needs. Our service team includes Toyota Master Certified technicians as well as mechanics who are ASE Certified in all auto repair disciplines, from brake and tire service to oil changes and transmission repair. Or, contact our parts team for the genuine Toyota parts your Toyota deserves! Why Buy At Fernelius Toyota? When you shop and visit Fernelius Toyota, you become a member of our family, and that includes enjoying family pricing and family care! Our modern dealership and service center is equipped with many comforts and conveniences that make any visit enjoyable. When you stop by our showroom, new and used car lots or service and parts departments, enjoy free Wi-Fi access and snacks and refreshments from our customer lounge and café. We are a pet-friendly dealership, and we cater to families with our dedicated play area for children while you shop or service with us. So stop by and become a member of the Fernelius Toyota family today! 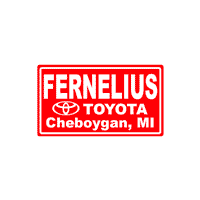 No matter if you are shopping for a new Toyota Tacoma that suits your active, Northern Michigan lifestyle or are in search of an affordable used car or SUV for sale, Fernelius Toyota is your source near the Petoskey and Sault Sainte Marie area. You can shop for your next vehicle and get pre-approved for auto financing or explore our current lease offers on new Toyota vehicles here on our website. Shop and apply for financing now, then visit us in Cheboygan!